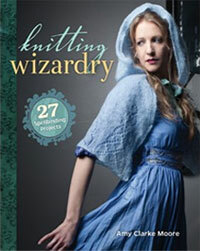 Knit the popular Ginny's Cardigan for less with this Bretton yarn kit and the new Knitting Wizardry book. Knit the popular cover cardigan pattern from The Unofficial Harry Potter Knits 2013 special issue magazine, now available for all in the new Knitting Wizardry book. And, knit it for less with Bretton yarn! 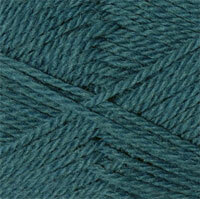 Each skeins contains 145 yards of yarn (50 grams). 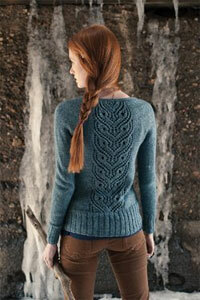 10 skeins of Bretton yarn is enough to knit Ginny's Cardigan up to a size 48 1/4" bust. This yarn from Patternworks is a superwash wool-blend that is both lightweight and sturdy, seems to soften after each washing. Originally designed with Classic Elite's Woodland yarn, this cardigan took the world by storm with it's publication in 2013. Featuring a graphic back reminesent of owl faces, it truly is spellbinding. This pattern is now featured in the new Knitting Wizardry book, modified and updated. This enchanting collection of 27 knitting patterns will take you deep into the realm of wizards, witches, and magical creatures. Revel in a broad variety of magical subject matter while employing a wide variety of knitting techniques: Cables for projects fit for giants and sorcerers; lace for glamorous shawls and gauntlets perfect to wear at the ball; cozy colorwork socks, caps, and mitts that will keep you warm while tending the herbal garden or wandering in the wild woods. You'll flaunt your own knitting magic in a variety of stunning cardigans, vests, and sweaters for men and women, including the popular Ginny's Cardigan designed by Mari Chiba. *Please note, this kit contains 1441 yards of substitute yarn, enough to knit Ginny's Cardigan in up to a size 48 1/4" bust with correct gauge. Hurry, we have a limited supply of each kit. Order your Ginny's Cardigan Kit today, while supplies last.